Animal Food Printed Bopp Multicolor Printed Laminated Pp Woven 10 Lb, 20 Lb, 40 Lb & 50 Lb Bags (5 Kgs, 10 Kgs, 20 Kgs, 25 Kgs) Packing Sack And Bag. We are the leading manufacturers and exporters of Pet Food Bags and Animal Feed Bags from India, many well known Dog food, Bird Food & Horse Food , cat food companies are engaged with us from the various markets, we are specialized to meet their exact demands for precooked food as well as Ready Meal Food by providing attractive looks and special features. We have got a tremendous knowledge in developing the bags for all kind of Animal food with the vast experience to make the best suited and properly applicable bag for the specified product; we develop the same with WPP laminated with OPP with customized designs and different solutions to care the product as well as to promote the product, Our Animal food bags are mostly used in USA, Europe, Middle East, Latin America, South Africa and West Africa. We offer bags with Handles and D – Cut, D - cut is only preferred mainly on 10 Lb Bags. 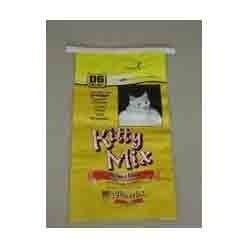 Looking for Pet Feed Bags ?